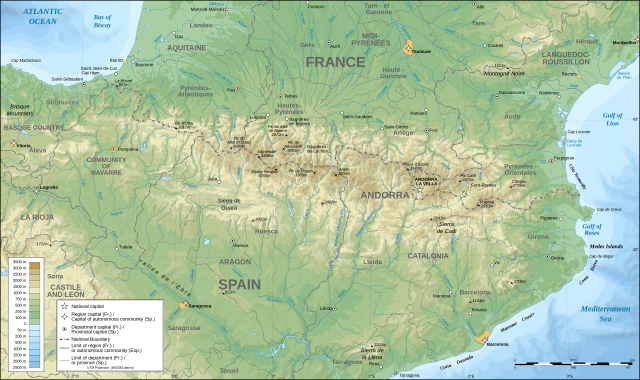 THE PYRENEES MOUNTAINS form the natural border between FRANCE and SPAIN, and have been a more effective barrier between the two nations than other ranges of similar height because of their characteristic ruggedness and lack of usable passes. Even more so than the ALPS, the Pyrenees were impassable to travelers for many centuries. Today, however, they are among the most attractive mountaineering and rock climbing locales in Europe. The chain is made up of two parallel ranges that run for roughly 266 mi (430 km) from the MEDITERRANEAN SEA west to the Bay of Biscay. The chain continues as the Cantabrian Mountains across northern Spain. The mountains can be divided into three sections—west, central, and east—with the loftiest peaks concentrated in the central section. In total, there are more than 50 peaks over 10,000 ft (3,000 m). The crest of the ridge forms the border between France and Spain, with a few exceptions, such as the Val d’Aran, which is north of the range but within the borders of Spain. The tiny nation of ANDORRA is also sandwiched between France and Spain, at the site of one of the few historic passes across the mountains, reputedly the site of Charlemagne’s crossing on one of his crusades against the Saracens in the 8th century. Another Pyrenean site associated with Charlemagne is the gap at Roncesvalles (or Roncevaux), the setting of one of the most famous chansons de geste, the Song of Roland, where the Franks’ most noble knight, Roland, lost his life in valiant defense of Charlemagne’s army in 778. Today, a monastic hospice still aids travelers across the pass, the best in the western Pyrenees, located northeast of Pamplona, Spain; the hospice has been a key stopping point in the pilgrimage route to Santiago de Compostela since the 12th century. The Pyrenees (Pyrénées in French, Pirineos in Spanish, Pirineus in Catalan) are older than the Alps, but are made of much harder material—mostly granite, some overlain with limestone—which has been resistant to erosion. The mountains have therefore maintained their size and ruggedness across the millennia. A lack of sizeable glaciers and relative dryness has also kept these mountains from appearing too worn. There is more rain in the west than the east, because of the prevailing winds off of the ATLANTIC OCEAN. As a result, the western part of the range is more lush than the east, with its Mediterranean climate. The Pyrenees are characterized by a lack of any significant lakes and few large rivers. Rainwater flows down the mountains in swift torrents, called “gaves,” which frequently tumble great depths over another feature typical to the region, high semicircular rock cliffs at the upper ends of stream valleys, known as cirques. The Gave de Pau contains both the highest waterfall in the range 1,525 ft (462 m) and the most famous cirque formation, the Gavarnie. The Pyrenees are also characterized by numerous caves and underground rivers. Water from the mountains drains south into the Ebro and the Mediterranean and north into either the Mediterranean via the Aude, the Têt, and the Tech or the Atlantic Ocean via the tributaries of the Adour and the Garonne. The watershed between these northern streams is the small spur of mountains, the Corbières, which also form a sort of climatic barrier between the Atlantic and Mediterranean zones. The north and south sides of the Pyrenees also differ in their structure. The French side tends to be steeper, with a more united front and broad faces of limestone or granite. The Spanish side is more gradual, includes some minor side ranges, and is also noticeably hotter and drier. The highest peak in the range, Pico d’Aneto at 11,168 ft (3,404 m), lies entirely within Spain. It is the center of the Maladetta Massif, close to the second highest peak, Pico de Posets (11,073 ft or 3,375 m), a few miles to the east. The third-highest peak, Monte Perdido (or Mont Perdut in Catalan; 11,007 ft or 3,355 m), is considered by many to be the most beautiful in the range, towering over the picturesque valley of the Ordesa, which today forms a Spanish national park. Pic Long (10,472 ft or 3,192 m) is the highest mountain entirely in France and was famously first climbed in 1846 by the Duke of Nemours, son of King Louis-Philippe. Also in France is the Pic du Midi d’Ossau (9,465 ft or 2,885 m), which is an isolated pyramid with two summits and dramatic rock walls, considered to be one of the finest climbing spots in Europe, with more ascent routes than any other peak. The Pyrenees are not rich in natural resources. There are some iron mines in the Ariège region of France, and some coal and lignite beds on both sides. More significant however, are the hot and mineral springs that are found throughout the range. Bagnières de Luchon and Eaux-Chaudes are both famous sulphurous hot springs. Another attraction to the Pyrenees are the religious shrines, most notably Lourdes. The mountains’ flora and fauna are somewhat unique because of their relative geographical isolation. Among the range’s unique species are the ibex and water-mole, blind cave insects, and several varieties of mountain rhododendron. There are few large settlements anywhere in the Pyrenees, with the exceptions of the eastern and western extremities of the range, where the formations are low enough to allow railroads and highways and the development of larger cities, such as Perpignan in France, and San Sebastián in Spain, a major center of Basque culture.